But if you made me choose my favorite chocolate chip cookie recipe, it has to be Jacques Torres’. The large size means that the edges are slightly crispy, while the inside is soft and gooey. The caramel flavor of the brown sugar really shines through. The sprinkling of sea salt at the end is the perfect compliment to the rich, dark chocolate. I’m still open to other recipe suggestions, but I have tried quite a few different recipes and I keep coming back to this one. I call these the “two-day cookies” because the recipe calls for letting the dough sit for a torturous 36 hours. TheBetterHalf doesn’t understand why I need to do this and gets kind of resentful when he sees me making chocolate chip cookie dough that can’t be eaten for two days. However I think the wait time is really worth it! I have tried baking the dough right away, and after only 24 hours. And the cookies are great, because after all, when is a warm chocolate chip cookie not great? But waiting the full 36 hours really brings out a unique caramel / toffee flavor. To read more about the science of it, look at this article. I don’t question the science – this is ChezCateyLou, not CateyLou’s Laboratory – I just trust it! The only change I make from the original recipe is the amount and type of chocolate. It calls for 1 1/4 pounds bittersweet chocolate disks or fèves, at least 60 percent cacao content. The disks are sold at Jacques Torres, and the fèves are sold at Whole Foods. I use Ghiradelli bittersweet chocolate chips instead (which can be found at most grocery stores), and I only use a bag and a half, about 15 ounces. I have used the entire 1 1/4 pounds of chocolate the recipe calls for and I thought it was just a little too much chocolate. Now I know you are probably thinking it is a bit of a pain to get bread flour and cake flour just to make a chocolate chip cookie. I get it, I really do. When I first tried to make this recipe, I had to go to 4 different markets in NYC to find cake flour. FOUR! I’m telling you, grocery shopping in the city can be quite frustrating. But it is worth the effort to get these two flours, and once you have bread flour in the house you have an excuse to make fresh baked bread! Mix well after each egg addition. Stir in the chocolate chips. How good does that dough look! Sift flours, baking soda, baking powder, and salt into a medium bowl. Using a mixer fitted with paddle attachment, cream butter and sugars together until very light, about 5 minutes. Add eggs, one at a time, mixing well after each addition. Mix in the vanilla. Reduce speed to low, add dry ingredients and mix until just combined, 5 to 10 seconds. Drop chocolate pieces in and gently incorporate them. Press plastic wrap against dough and refrigerate for 24 – 36 hours. Dough can be refrigerated for up to 72 hours. When ready to bake, preheat oven to 350 degrees F. Scoop 3 1/2 ounce mounds of dough (the size of generous golf balls) onto baking sheet (about 6 will fit on a standard baking sheet). You might have to roll the dough into balls in your hands. Sprinkle lightly with sea salt and bake until golden brown but still soft, 15 – 20 minutes. Interesting about the waiting time…I must try them. These look amazing! Is cake flour the same as self raising flour in the UK? No they are not the same – self rising flour contains a leavening agent. Two kinds of cake flours I like are http://www.kingarthurflour.com/shop/items/unbleached-cake-flour-blend#3502# and http://reilyproducts.com/products?mode=list&id=&brand=15. Hope you can find cake flour in the UK! Thanks definitely want to give these a go! I’ve been dying to try Jacques Torres’ chocolate chip cookies…and now seeing yours, I’m not waiting any longer! Gorgeous! Thanks, Carol! It is a great cookie recipe, I think you will love it! Oh my. The beauty and goodness of a proper chocolate chip cookie will never cease to amaze me. I have tried them all, or so I thought. I can’t wait to make these, thank you for sharing! The combo of the salt with the sweet chocolate chips is so delicious! I think you will love them when you do, they are the best! It was very hard not to eat all of them warm out of the oven! 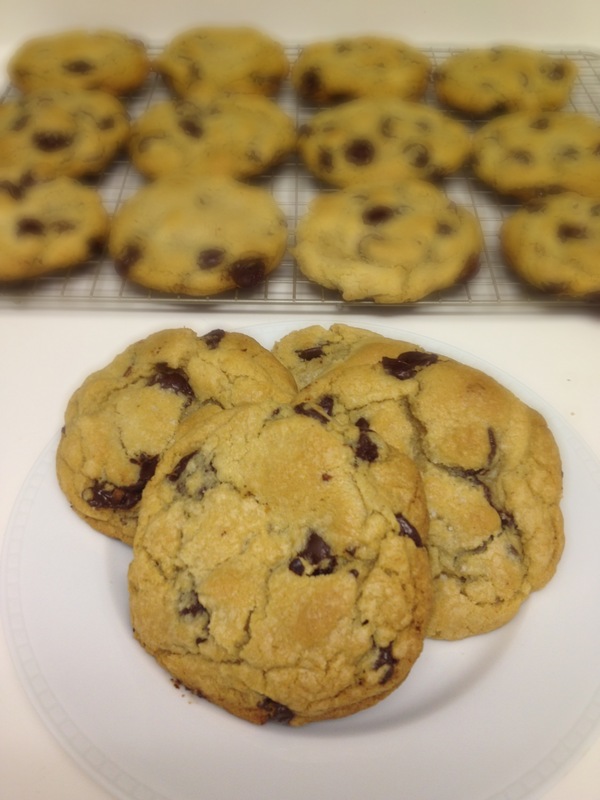 CateyLou, this chocolate chip recipe is our favorite cookie in the universe! I am impressed that you are open to more choc chip recipes because we have stopped looking. :). You got great photos of the deliciousness! The header on my blog is of these cookies but my color is way off. I will have too do it over at some point. I do have a hint that will thrill your “better half”. After making the dough, scoop onto balls, place close but not touching on a cookie sheet and freeze. When frozen, you can keep them in a gallon zip lock bag. I keep a supply on hand in the freezer and make more when we are running low so that we never have to wait the 36-48 hours for a cookie fix! This is my favorite chocolate chip cookie recipe! I think using coarse salt in the dough makes a huge difference (the first time I made them I used regular grain salt). Last time I was in New York I stumbled across a small spice shop and bought some alderwood smoked sea salt, which was fantastic on top of these cookies! That smoked sea salt sounds like it would add such a unique dimension to these cookies! What a great idea! Holy cow, I’m salivating. I have to make these. Ye gods, they look good! I have celiac disease, and I’ve been using a coconut flour-based chocolate chocolate chip recipe from WholeFoods.com for a while, but I like this chocolate chip cookie recipe from Chef Jacques Torres a lot, too! Thanks!